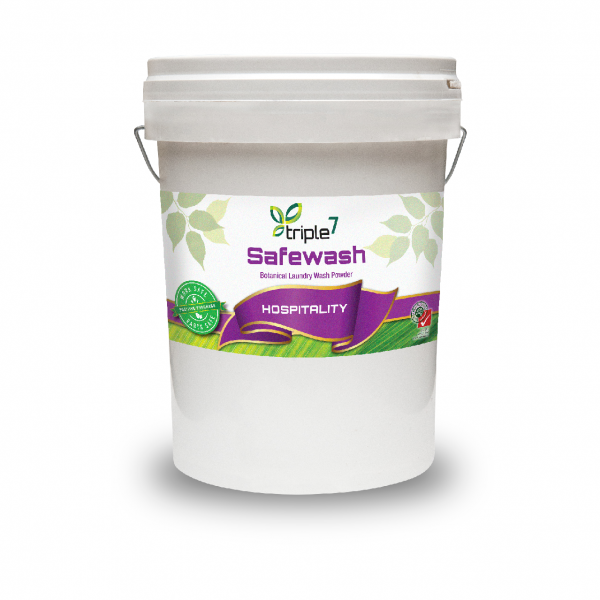 Triple7 Safewash Powder is a high performance, bio-based laundry wash, free of all toxic and hazardous additives. Ideal for sensitive environments and septic systems. Will not harm sewer bacteria. Use Triple7 Safewash on any fabric compatible with water in laundry applications. Always follow garment label instructions. Sort laundry as usual. 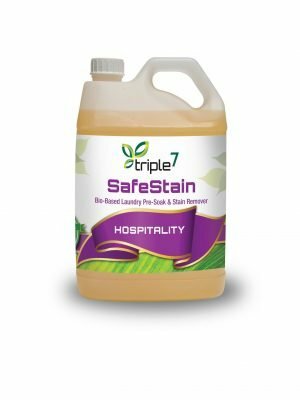 As machine fills with water, add Triple7 Safewash Powder. The product is effective in cold water but works best at 35ºC. Hand washing / Soaking 30 grams per 10 litres water. Soak for 30 minutes or overnight and rub into stain before washing. Stubborn Stains Spray with Triple7 SafeStain and follow washing instructions as above. Always pre-test for colour fastness. Triple7 Safewash will also release scum and latent odours from washing machines and pipework. It is recommended to do 2 empty loads first, using double the normal amount of liquid or powder, prior to putting clothing in the machine. 1. Do not over-use Triple7 Safewash, as too much product is wasteful, requires added rinse water and may cause over sudsing. 2. Pre-soak stained fabrics to remove grass, blood, ink, lubricants, felt marker, paint, tea, coffee, urine, coke and tar residues. 3. Washing with warm water (minimum of 35ºC) gives better release of protein allergens and organic stains. 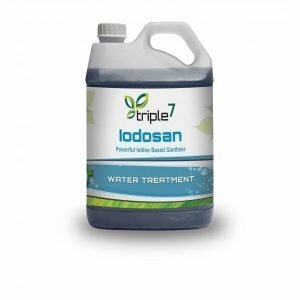 Triple7 Safewash Powder releases scum and waste deposits from pipework and reduces latent odours. 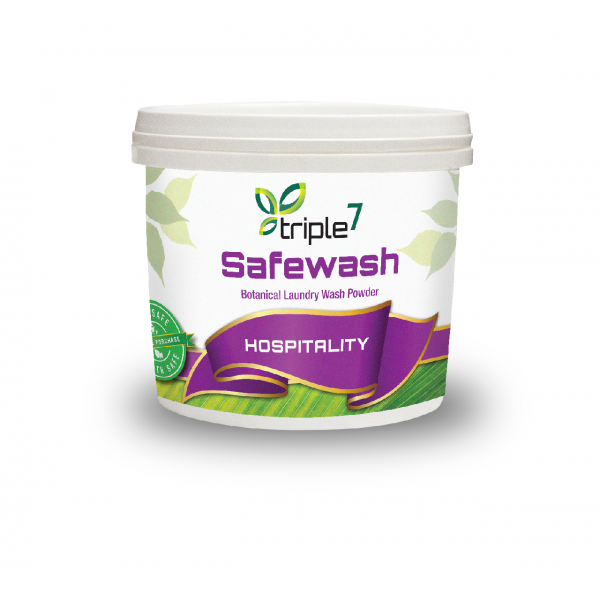 Triple7 Safewash Powder has no added salt loadings and improves clarification and soil percolation whilst removing odours. It is suitable for use in septic systems, grey water and re-use systems. Less product is required compared to conventional laundry cleaners. A lower water temperature is also required when using Triple7 Safewash Powder cutting power costs. Unlike traditional detergents, Triple7 Safewash Powder cleans without damaging the cleaning surfaces, seals, rubbers & pipework systems. It improves machine performance as well as preventing rust and corrosion. Triple7 Safewash Powder has no Hazchem rating so it needs no special storage areas, lowering the cost of transport, handling and storage. Triple7 Safewash Powder contains an anri-allergen additive reducing skin irritation and allergic reactions. The product is free of caustics, bleaches and phosphates. It has no toxic fumes or strong masking fragrances, but rather destroys the odours at their source. Triple7 Safewash Powder improves the quality of grey water. It contains no ozone depleting chemicals or hazardous air pollutants and the product is 100% biodegradable. Furthermore, Triple7 Safewash Powder does not upset the delicate balance of nature’s ecosystems, but rather enhances them. Triple7 Safewash Powder creates healthier and more pleasant working environments by reducing toxins and allergens in the workplace, lowering the risk of chemical sensitivities from cleaning products. As a mother of four children, I am constantly washing and until 6 months ago gave little thought to what I used. Then our youngest child suffered a severe allergic reaction to something and went into respiratory distress. After a harrowing few hours and three shots of adrenalin the doctors told us she was okay but they had to find out what she was allergic to. A few days later we got the news that it was a common chemical found in washing powder. We discovered that it was, in fact, in most washing powders and were at a loss as to how to wash our clothes effectively again. Then someone recommended Triple7 Safewash. 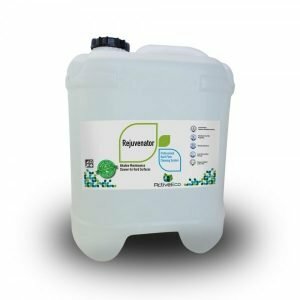 It was a saving grace, it not only washed our clothes, but was completely effective without the need for other chemicals such as fabric softener and stain removers. 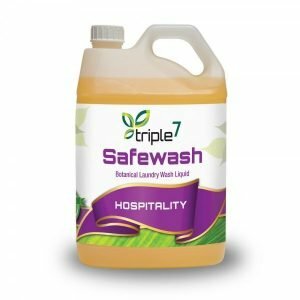 Triple7 Safewash has solved our washing dilemma, washing smells fresh and best of all we are not putting our children at risk of chemical exposure. Grateful mother.